WHO? An exhibit of Ray Kaselau’s animal creations, which are made of cardboard, tape, papier-mâché, and paint, opens Sept. 6 at the Volume One Gallery. Ray Kaselau was around 12 years old when he started making the mask of his childhood hero, Batman, and running around his neighborhood fighting crime. Years later, the western Wisconsin artist has again picked up the cardboard and papier-mâché to put together a collection of animalistic creations that will be featured in an exhibit at the Volume One Gallery, 205 N. Dewey St., which opens Friday, Sept. 6. Kaselau began this artistic venture by creating a giraffe when he found some cardboard and started to make it from the top down. After about 30 hours of work, it was a nine-foot masterpiece. He began to draw inspiration from visually extravagant shows such as Cirque du Soleil and The Lion King musical. That shows in his work in the form of a Minotaur mask, a large lion head, and a fierce Bengal tiger. The sculptures are formed from layers of cardboard, tape and papier-mâché, covered by acrylic house paint. He tried to switch up the form on his work, changing his sculptures into different abstract forms. 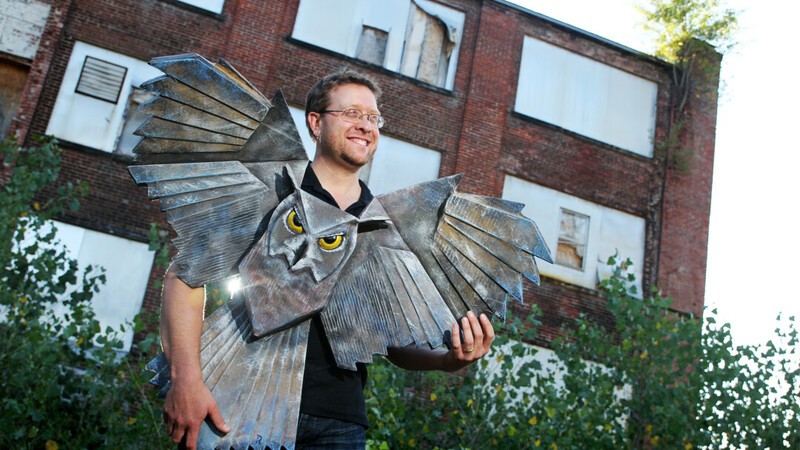 In fact, one of his pieces was inspired by the couple’s experience of a close encounter with a great horned owl. The sculpture that he made has outspread wings and large yellow eyes made from sculpting clay, later sealed over by clear nail polish for a shiny finish. His featured sculptures also include an antelope head, a water snake, a zebra, and more. His color combinations pop off the corrugated work and give them a strong 3D presence. Kaselau’s work goes far beyond the realm of sculpture, though. Kaselau has a degree from Brown College in Minneapolis, focusing on graphic design and visual education. He since has worked for national companies such as Nintendo of America, 3M, and many Wisconsin civic organizations. Designing in a variety of fields ranging from advertising to retail design, he has expanded his work to many different mediums. He also has gotten a start on his dream of illustrating comics and children’s books. He grew up reading Batman comics and continued in his love for comics by creating superheroes to “defeat the recession” in a Chippewa County comic series, as well as created cartoon characters for the Edge Outreach program.